Lifeless Planet is the one-man jam of David Board, who has worked relentlessly on the solitary sci-fi title since 2011. 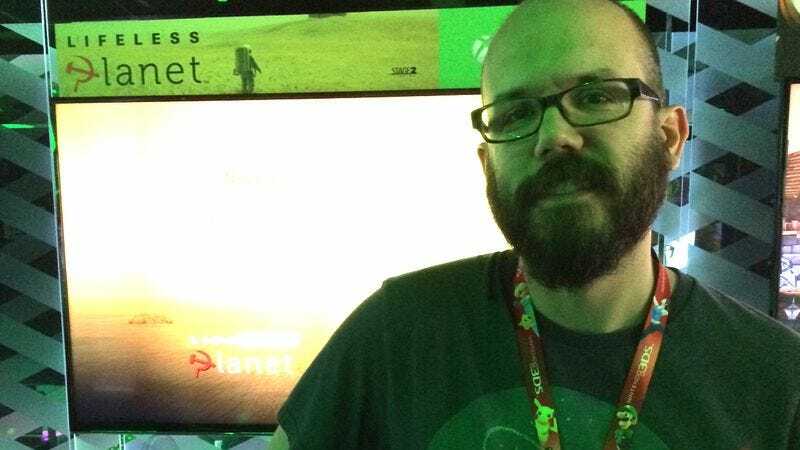 Board told Gameological that it’s been “one crazy week”: His game released on Steam last Friday, and then Board headed to Los Angeles to present an upcoming Xbox One version at E3. Luckily, Board still felt spry enough to answer our Questionnaire. David Board: Aw, man. I’ll tell you, he’s got this jetpack. It would be groovy if, like in the style of Spacecraft, how they can maneuver in all different directions. I think you’d need an extra thumb, but kind of jet yourself in different directions and save yourself when you’re about to go flying off a cliff. That’d be groovy. DB: So he’s a geologist astronaut. There’s all sorts of scientific logs on the planet. If you’re paying attention, if you are spending the whole summer, you’ll absolutely find those scientific samples. You’ll learn a little geology, a little exoplanet science. DB: Oh, man. When you’re setting up cutscenes, very often you want to do something as simple as have a character pointed at another character, right? I’m talking to you, I’m facing you. And you do that in the vertical dimension. So we rotate the character in the right dimension. I have a scene in here where he finds one of his crewmates injured on the ground. I set up the cutscene and ran it, but instead of orienting himself by turning and looking at the character on the ground, he levitated in the air vertically and hovered over him like a poltergeist. Which to took that scene to a whole ’nother level. I’ve got a screenshot of that. AVC: How do you feel about the current trend of games being released in early access? DB: I took this game to early access on Steam for a little different reason, maybe, than some other people do. I think it makes a ton of sense, obviously, for multiplayer games where you’re constantly refining and balancing, and you really can’t test it without a ton of people playing. In this case, it’s a solo game. The reason I did it—and talking with Valve everybody seemed to think it would be a good idea—is that I am a one-man dev crew. I don’t have a big army of Q.A. testers. I went to Kickstarter, and I got some beta testers there, but as I got towards the end of the game, people didn’t want to play it all. [Early access] worked well for that, and it got 97-percent positive reviews on Steam during early access, so I think the people liked it as well. I’ve heard a lot of complaints about too many games going to early access, but honestly, the way I see it is, it’s voluntary, right? So if you don’t like it, you don’t have to play. It was a good thing for my game, absolutely. AVC: If your game had a super-deluxe version that cost $1,000, what would be in the box? DB: It would be my game and $960, because that would be cool. [Laughs.] But no, golly, man. I’ll tell you this, I had Kickstarter backers give me a thousand bucks, and one of them didn’t even want a copy of the game. It blows my mind that people are so—they think the idea of going to another planet and finding evidence of human habitation, the hook is so cool, this Twilight Zone vibe, that I think a lot of people are, “I just got to see this game made.” I don’t know that I would do a lot more than, by golly, take another three years to make it perfectly polished. I like the whole story and the vibe of it.